I made these a few days ago. They were really nice I promise you. The most important step in making them is simmering in baking soda (bicarbonate of soda) solution for 30 seconds. Please do not omit this step. Half the pretzels were sprinkled with salt and the other half with cinnamon. My daughter loved the cinnamon ones, I loved the salted ones. Have a wonderful week, ahead! and leave in a warm place for 1 hour or until doubled in size. Bring the 5-cups water to a rolling boil and add the baking soda to the water. then place onto prepared baking sheets. 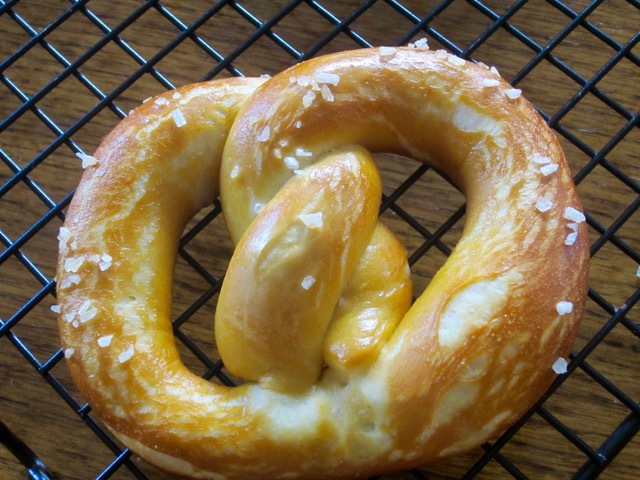 Brush each pretzel with the egg yolk and sprinkle with kosher salt. You can also sprinkle with cinnamon sugar. Bake in the preheated oven until golden, about 12-14 minutes. Preheat the oven to 425ºF (220ºC). Line two large baking sheets with parchment and grease or spray the parchment with oil. Sift or whisk the flour, yeast, sugar, and salt into the bowl of the mixer. Make a well in the centre. Lightly oil the bowl and place the dough in the bowl. Cover with cling film and leave in a warm place for 1 hour or until doubled in size. Bring the 5-cups water to a rolling boil and add the baking soda to the water. 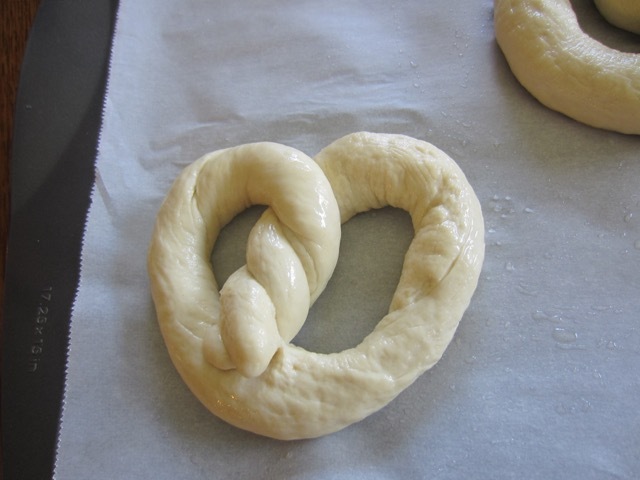 Reduce to a simmer and dip each pretzel into the baking soda solution for 30 seconds (do not leave longer). Using a slotted spatula, lift the pretzel out of the water and allow as much excess water to drip off then place onto prepared baking sheets. 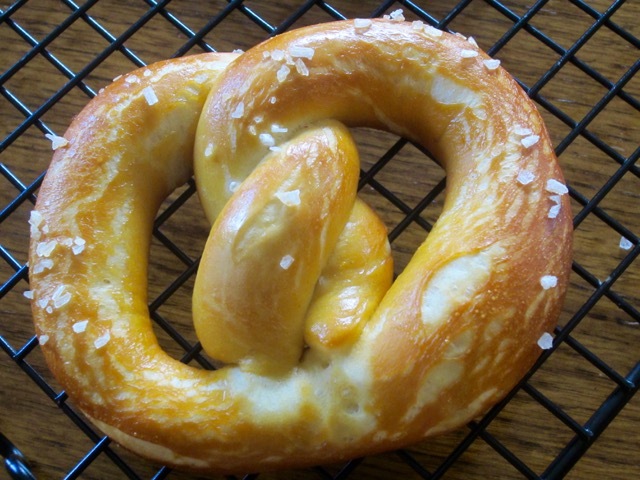 Brush each pretzel with the egg yolk and sprinkle with kosher salt. You can also sprinkle with cinnamon sugar. Bake in the preheated oven until golden, about 12-14 minutes. 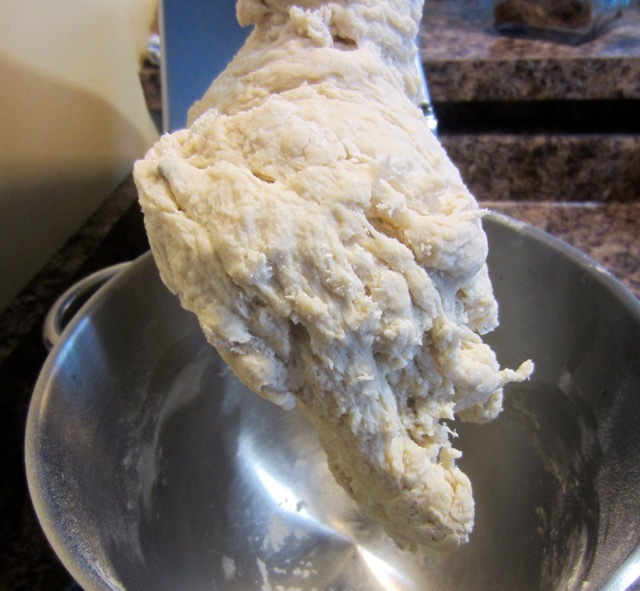 If mixing by hand, pour the water into the well and mix with a spoon until the dough comes together.Turn onto a lightly floured surface and knead for about 8 minutes. When rolling the dough wet your hands with a little water from time to time. I first rolled mine into short 6-inch ropes then rolled them into longer ropes. 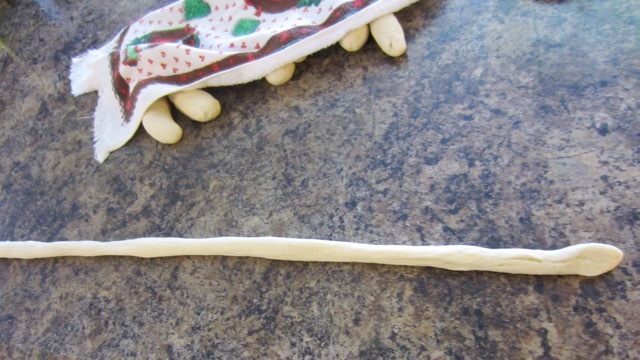 This gives the dough time to rest and they become easier to roll. Do whatever works for you best. I prefer the salty ones, anytime! We love soft pretzels! Hubby makes them in our house using a German recipe, so delicious! Can I have that German recipe. The best pretzels come from Germany. Have a lovely day! 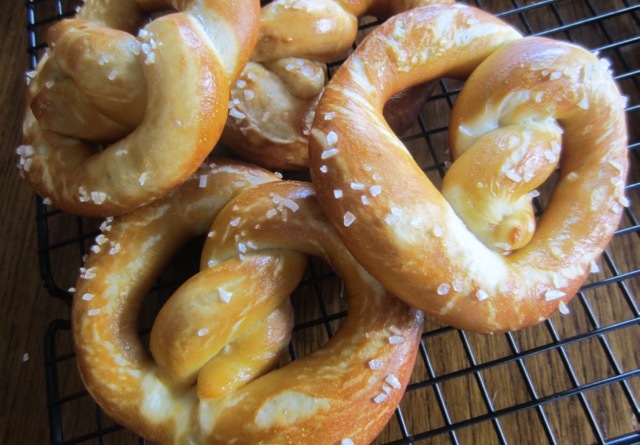 These turned out heavenly, I usually associate pretzels with malls or shopping trips and don’t give them a chance at home, with this recipe I definetly will! oh yes they were so good. You can actually make them for yourself!!! 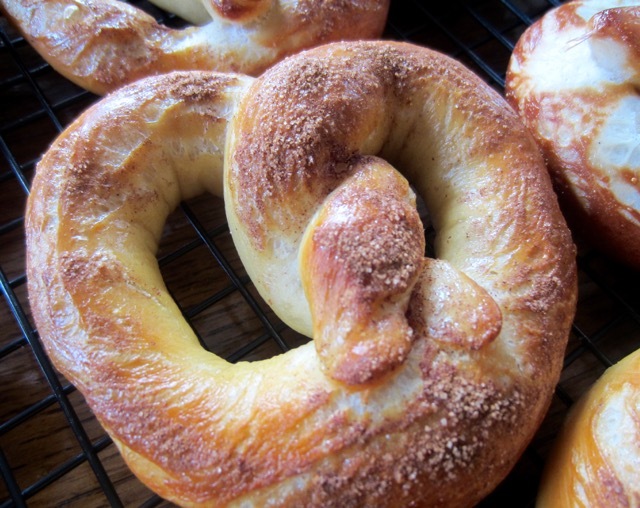 Yum, I love a homemade pretzel! I hope you found time to make it! I love pita bread…I hope you’ll get around! I love pita too, I will send pix when I get it done. Thanks. I look forward to! One of my grandsons makes these perfectly….I don’t! I am going to try your recipe. They are making my mouth water just looking at the photos! Good job Liz! Off to enjoy the sunshine! Have a great week ahead! Enjoy the sunshine Sandy. I cooked a lot over the weekend so I’m trying to post everything on the dashboard. I’ve eaten a lot too coz cooking means eating. We had cornish pasties for lunch and dinner yesterday. I didn’t have swedes though so I just added plain old carrots but still they tasted nice. Will be posting them this week. Thanks for your ever undying support. You are awesome!! !